Have you ever had something that you liked so much that you thought about it the next day and the day after that? I did! My girlfriend and I went to Panera for lunch and I usually order a sandwich, but that day I ordered soup and a salad. 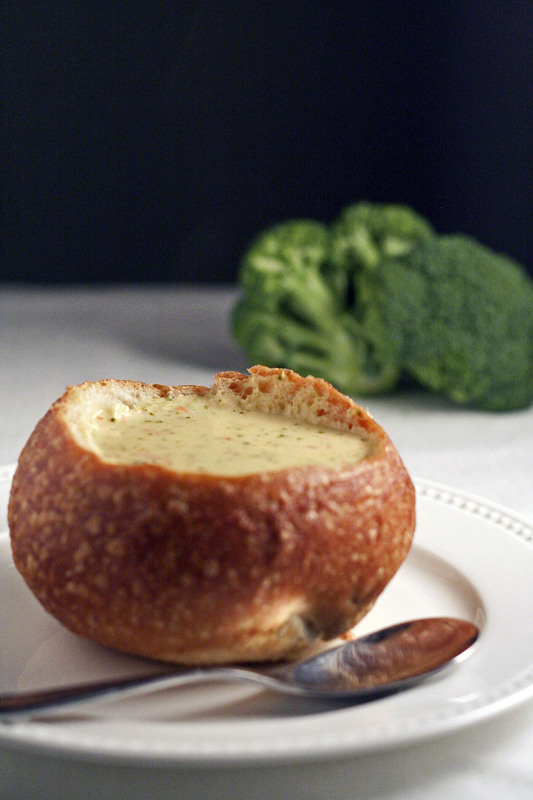 I had never tried Panera’s soup and ordered the Broccoli Cheese Soup – WOW – It was love at first taste! I never imagined that broccoli cheese soup would taste so good. I was determined to replicate that soup at home and searched the internet until I found a recipe that sounded perfect … and it didn’t disappoint. It is every bit as good as Panera’s – try it for yourself and see. Sauté onion in butter. Add the rest of the butter and flour using a whisk over medium heat for 3-5 minutes. Stir constantly and add the half & half. Add salt and pepper. Puree in a blender. Return to heat and add cheese. Stir in nutmeg. This entry was posted in Soup, Vegetable and tagged Broccoli Cheese Soup, cheddar cheese, Cheese, Food, recipes, soup by Pasta Princess. Bookmark the permalink. My favorite item on their menu! Unfortunately I can only have it once a year when I go back to the US. Thinking on starting a petition to have one opened in Hong Kong. No if we could only learn the secret to their sourdough bowls! It was truely “Love at first taste!” Can t wait to try yours! I love soup and cheese, got to make this. So do I, I really didn’t think it would be this good! Even my fussy husband who said “don’t bother making any for me” loved it! i never cook this in my kitchen cos it’s kinda hard to find a firm whole meal bread here..
i just love this appetizer when i visiting my fave french restaurant.. It is now one of my favorite soups and so filling with a bread bowl! It’s just as good without a bread bowl too. Yes! This is my favorite soup there, I usually get it in the regular glass bowl. Way to much bread for me! I have to agree with you – I was too full to eat the bread bowl … but my husband was happy as he had it the next day! Pingback: Trees and Cheddar Soup | What's On the Stove?